RTI released world’s first RGB white light, analog modulated beam array with real scanners. This allows for completely new effects that could have never been created before: Wave effects of parallel beams, three-dimensional twists of beams in mid-air and spectacular color-fades make the RTI NEO SIX RGB a spectacular new lighting effect for professional stage productions. The initial beam positioning can also be made through DMX, and the unit can save the settings that were made. So when setting up the stage, each beam can be set to its individual zero-position via DMX, and on exiting the setup mode it preservers the set position – even on power loss. Having this feature makes it easy to set beam positions, e.g. on mirrors, or to avoid manual beam aligning when the units hang high up on the truss. 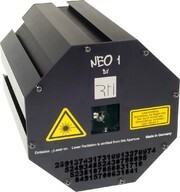 The RTI NEO ONE is a whitelight RGB show laser light that is easily extandable with any number of other RTI NEO ONE systems thanks to an innovative connection system. All RTI NEO ONE devices are controllable through DMX and thus are suitable for easy implementation to existing lighting setups. You'll only need one PSU for up to six devices. A great show laser light for stages, live gigs, nightclubs, show productions and any event which requires a unique visual enhancement that can be easily mounted. RTI released world?s first RGB white light, analog modulated beam array with real scanners: the RTI NEO SIX This allows for completely new effects that could have never been created before: Wave effects of parallel beams, three-dimensional twists of beams in mid-air and color-fades make the RTI NEO SIX RGB a spectacular new lighting effect for professional stage productions. The RTI NEO SIX has been especially developed for professional touring and production companies. The effect becomes most spectacular when several NEO SIX play side by side. Besides the NEO SIX, the NEO Series comprises the RTI NEO ONE show laser lights with their special ability that a random number of projectors can be connected with each other thanks to an innovative connection system.